A regenerated neighbourhood of Paris is becoming a world-leading example of how to construct a sustainable, net-zero carbon city with Passivhaus design, renewables, biodiversity improvement, water sensitive urban design and smart waste practices. 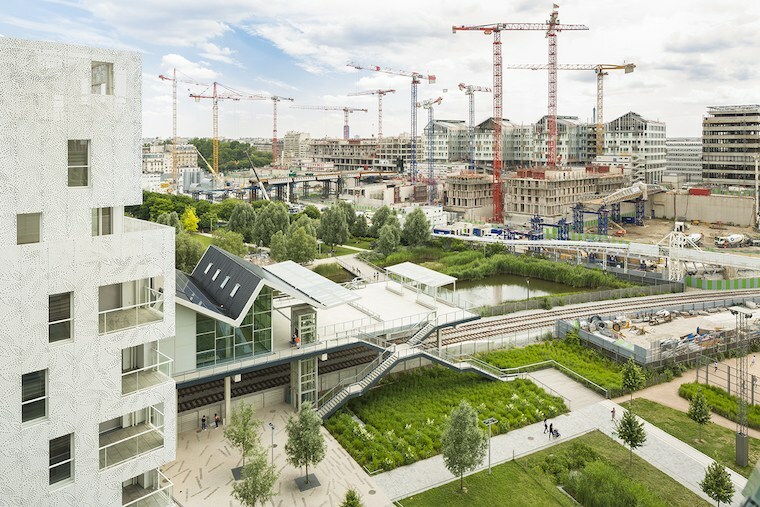 As befits the city that gave the world the Paris Agreement on climate change, the Clichy-Batignolles development is being constructed in line with the city’s ambitious sustainable development policy, particularly its climate and biodiversity plans. Located on the site of an old railway yard in the 17th arrondissement in the city’s north-west, the 54-hectare urban renewal project will eventually be home to 7500 residents and provide employment for at least 12,000. At its heart is a 40,000 square metre park. At a total cost of €505.7 million (AU$778.8 million) it will eventually comprise a judicial centre, theatre, cinema, 495,000 sq m of real estate including 200,000 sq m of housing (of which half is social housing, 30 per cent owner-occupied, and 20 per cent intermediate), 105,210 sq m of offices, 25,000 sq m of shops, and 28,000 sq m of public facilities. The area along Avenue de Clichy, containing 1400 housing units, is now complete. Construction is underway on the other bank of the park and at the Porte de Clichy, and will be finished by 2020. The district was awarded an EcoQuartier label from the Ministry of Housing and Sustainable Housing in 2016, won the Sustainable City Grand Prize in the international Green City Solutions Awards, and received European funding for the creation of the first smart grid in Paris. All buildings are being constructed to the demanding Passivhaus standard, meaning that the energy consumption required for heating is just 15 kilowatt-hours a square metre of floor space per year, and the overall energy consumption is under 50kWh asqm of floor space per year. The buildings are south-facing and super insulated, capturing and retaining the sun’s heat and warmth given off by their occupants and technology. Buildings are composed of renewable materials while other materials such as PVC are banned. The area will contain 40,000 sq m of solar photovoltaic roofs that will eventually generate around 4500-megawatt-hours a year to supply 85 per cent of the remaining energy needs, while deep geothermal energy will provide 83 per cent of the space heating and domestic hot water, so that the entire site will have a carbon neutral footprint. Following the guidelines of the biodiversity plan, the development’s Martin Luther King Park contains over 500 species planted around a wet ditch and a biotope basin, which forms part of the sustainable urban drainage design. Combined with permeable surfaces linked to underground reservoirs, rainwater run-off is about half that of conventional projects, to minimise pollution and irrigate the park. A range of plants are also found alongside roads, landscaped island cores, 6500 sq m of private gardens for residents to grow food and 16,000 sq m of green roofs. Two further community gardens give opportunities to grow food and compost food waste. The park forms part of a chain of green spaces that threads through Paris, including Parc Monceau, Bois de Boulogne, several squares (including those of Batignolles and Épinettes) and the cemeteries of Montmartre and Clichy. Waste (except for glass) is collected by an underground pneumatic network and sucked into a collection terminal on a nearby boulevard from where it is distributed to treatment and recycling centres. By removing the need for lorry collection this reduces greenhouse gas emissions by 42 per cent, carbon monoxide emissions by 98 per cent, nitrogen oxide emissions by 86 per cent and particulate emissions by 90 per cent. Car use is minimised and walking and cycling are encouraged through neighbourhood design. A metro line, a rail link and a tram connection are to be extended to the district. An iconic 160-metre-high tower designed by Renzo Piano will house the future Paris Palace of Justice. Diversity is ensured by combining social family homes, free or at controlled rents, residences for students, with homes for young professionals and elderly people, plus shops, public facilities and offices. The project is managed by a public local development company, Paris Batignolles Aménagement. This is a public limited company with a capital of €6 million (AU$9.24 million), 60 per cent owned by the City of Paris and 40 per cent by the Paris Department. It was created in 2010 to lead the development of Clichy-Batignolles, and subsequently given responsibility for the whole of Paris. Since December 2016, Paris Batignolles is in charge of four more developments: Saint-Vincent-de-Paul; Pouchet Gate; Paul Meurice sector, Porte des Lilas neighbourhood; and Chapelle-Charbon. A team of 26 experts is headed by Jean-François Danon, who works closely with deputy mayor Jean-Louis Missika, responsible for urban planning, architecture, the project of Greater Paris, economic development and attractiveness. Despite all of this effort, the energy use of the first residents is higher than the design team expected, so the buildings have not quite achieved net zero carbon emissions. A team (called CoRDEES – Co-Responsibility in District Energy Efficiency & Sustainability) is working to reduce this gap by using a €4.3 million (AU$6.62 million) award from the European Union’s Urban Innovative Actions Initiative to develop smart grid technology. This will be a community-based system to help residents monitor and manage their energy use. The Community Energy Management Platform will process energy data from buildings (electricity and heat) and public facilities (electric vehicle stations, street lighting and automated waste collection) in real time to define optimisation scenarios. It aims to achieve the objectives of the climate change plan, to emit 90 per cent less CO2 and satisfy Passivhaus requirements. This is expected to create a new economic model based on energy savings and the creation and perpetuation of new services. “Smart grids at the local level are central to build a zero carbon city,” Jean-Louis Missika said. All of this will allow Paris to demonstrate excellence in sustainability, showing how cities can become carbon neutral and provide a home for both nature and people.